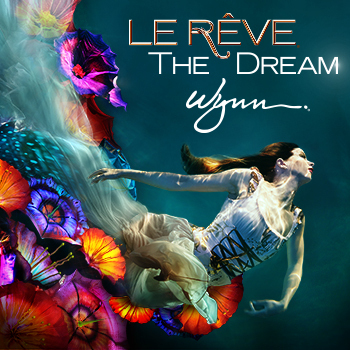 Close your eyes and prepare to enter Le Reve, for you truly go into a dream-like state in this surreal and decadent production. The audience is seated around a stage that is literally transformed over and over again, before your very eyes. Watch as a pool of water that descends over 25 feet rises up to a platform where aerialists, gymnasts and other acrobats perform stunts of awe and beauty, this is pure imagination brought to life. From creator Franco Dragone comes the show that has been hailed as the ‘Best Show in Vegas for five years.’ Watch technical spectacles of pouring rain and explosive fire all while synchronized swimmers, dancers and artists from around the world create a whirlwind of wonder. Located at the Wynn, this truly beautiful and immersive production is what it must feel like to actually be inside of a dream where the laws of physics no longer apply. Great show, not a bad seat in the house! There wasn’t a bad seat in the house. Performers were excellent and kept our attention the entire time. Worth the price! Our seats were good and the show was amazing. Amazing Show! Definitely will come back to see it again!